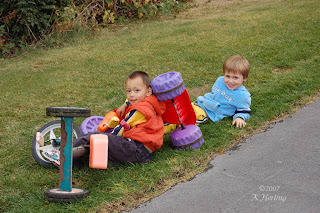 Yesterday I finally got pictures of all of us at the park. It was a great day to go, slightly overcast, but not as cold as last week. 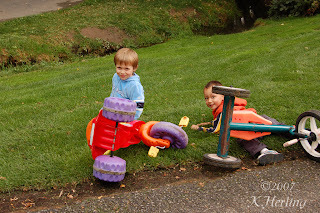 On the way back from the playground Isaiah and Shoresh decided it would be fun to run off the path and "crash". They were so cute I took some pictures. Then they rode off and got a ways ahead of us. 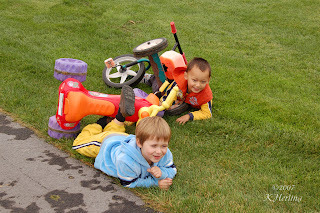 Pretty soon we caught up to them because they had crashed again and were "posing". It was too cute and of course I obliged and took more pictures. Can I say that I LOVE my camera? It's a Nikon D-50 and it's wonderful! The whole crew: 3 moms, 6 kids and one on the way! Mee Sook is due to have her 3rd at the end of January. Woo hoo! Awww! What a cute bunch! I just got a new camera and I can't figure it out! I'm sending to you for the Autumn Goody Swap hosted by arewethereyet.com. I can't wait to get to know you better! If you will send me an email at msred5 [at] yahoo [dot] com I can get your mailing address and we can chat some. How fun are all of you!? Sounds like a great day!